Complex networks often contain several subnetworks, and the user may want to assign specific IP address ranges for them. This step demonstrates how to assign a range of IP addresses to subnets. This step uses the ConfiguratorA network, as in the previous two steps. One switch and the connected hosts as a group will be on the same subnet, and there are three such groups in the network. 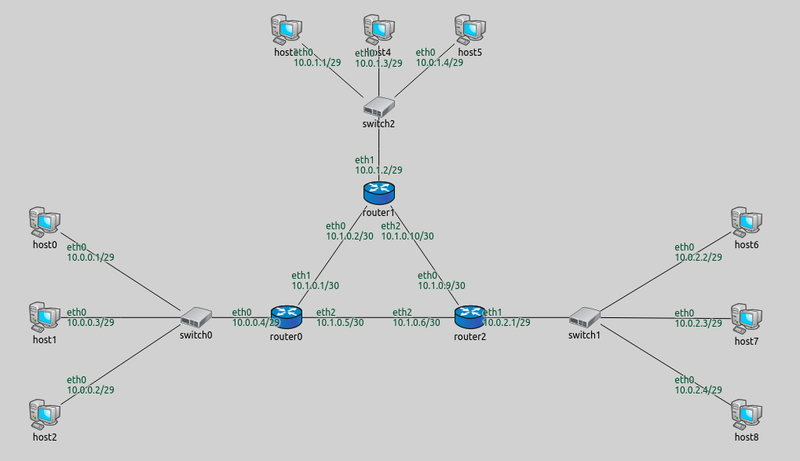 description = "Automatically assigning IP addresses to a subnet from a given range"
The first three entries assign IP addresses with different network prefixes to hosts in the three different subnets. The next three entries specify for each router that its interface that connects to a subnet should belong in that subnet. These entries use the towards selector, which selects the interfaces that are connected towards the specified host or hosts. The last entry sets the network prefix of interfaces of all routers to be 10.1.x.x. The routers’ interfaces facing the subnets were assigned addresses by the previous rules, so this rule only effects the interfaces facing the other routers. These seven rules assign addresses to all interfaces in the network, thus, a default rule is not required. The among selector selects the interfaces of the specified hosts towards the specified hosts (the statement among="X Y Z" is the same as hosts="X Y Z" towards="X Y Z"). This one assigns an address to one host in each of the three subnets. It assigns addresses o the interfaces of the routers facing the other routers, and includes a copy of the default configuration. Because assignDisjunctSubnetAddresses=true, the configurator puts the unspecified hosts, and the subnet facing router interfaces into the same subnet as the specified host. The assigned addresses are shown on the following image.